Degenerative disc disease (DDD) is a chronic and progressive disease that is characterized by inflammation and breakdown of tissue within the intervertebral disc. Located between the vertebral bones in the spine, the intervertebral disc acts like a pillow to cushion and evenly distribute pressure cross the vertebrae. Each disc is comprised of an outer fibrous ring, the annulus fibrosis, which surrounds an inner gel-like center, the nucleus pulposus. When the intervertebral disc becomes inflamed and loses its structure, the disc tissue becomes rigid and weakened, and begins to collapse. This can result in pressure being applied to the surrounding nerves in the spinal column, causing pain and loss of function. DDD in the lower back can cause acute or chronic pain at the site of degeneration and may also be felt radiating into the hips, buttocks, thighs or legs. Pain is most commonly felt or made worse by movements such as sitting, bending, lifting or twisting. Current treatment options include pain management (including opioid use), physical therapy, steroid injections, ablation, chiropractic care and other alternative remedies in the earlier stages, and surgical intervention in the later stages. DiscGenics is conducting a prospective randomized double-blinded, vehicle- and placebo-controlled, multicenter clinical study in the U.S. among subjects with single-level, symptomatic lumbar DDD. The purpose of this research, which has been allowed by the U.S. Food and Drug Administration (FDA), is to study the safety and preliminary efficacy of IDCT, a non-surgical cell therapy for the treatment of DDD. 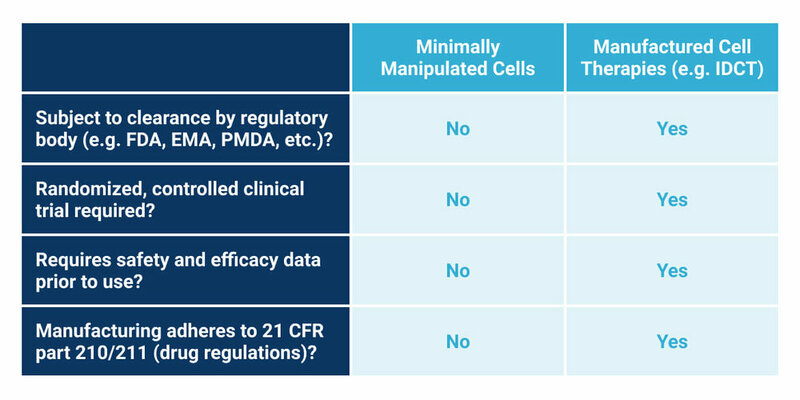 While DiscGenics is advancing its DDD treatment through a stringent regulatory process, not all cell therapies are required to adhere to the same level of regulatory rigor. Some cell-based therapies, like IDCT, undergo significant transformation during the manufacturing process and are subject to clearance by regulatory body (e.g. FDA, EMA, PMDA, etc.). On the other hand, some may be only minimally manipulated prior to application and thereby are not required to abide by regulations that ensure the safety and efficacy of a treatment. Before beginning treatment of any kind, we encourage patients and their families to understand the rigorous levels of testing for safety and efficacy a product has undergone before considering it as a treatment for themselves or loved ones. Disclaimer: IDCT is an investigational product that is under development by DiscGenics and has not been approved by the FDA or any other regulatory agency for human use.